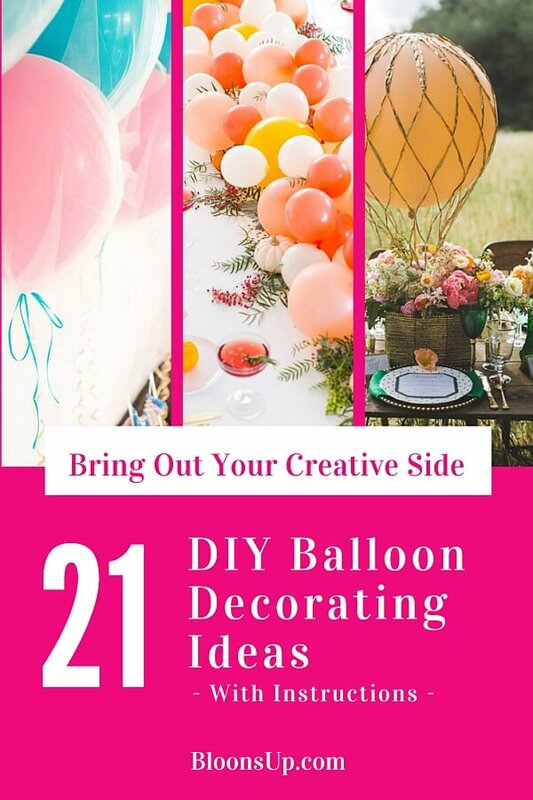 Choose from 21 splendid balloon decorating ideas to make your next party or event extra special. This list comes complete with DIY instructions and pretty photos! Ever wondered how to get this enchanting spiral pattern into a balloon arch? It's a simple trick of arranging balloons in contrasting colors. The classic, floating "String of Pearls" arch creates an elegant frame for a wedding head table. It's one of the easiest designs you can make yourself. Just follow our DIY instructions here. 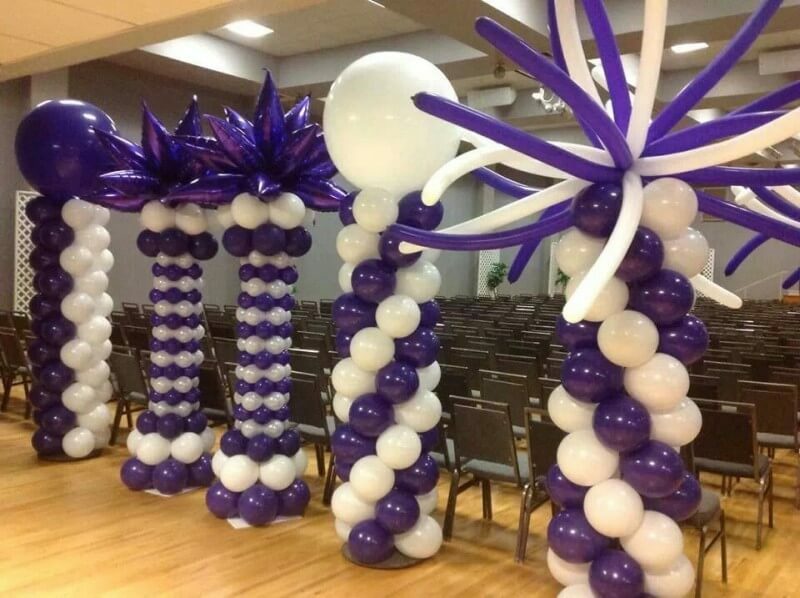 Balloon columns (also called pillars or towers) offer countless variations in style, size, color and pattern. You're bound to find one that suits your taste. 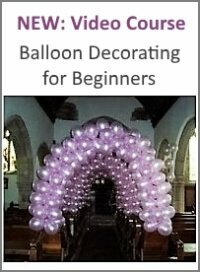 To make them yourself, follow our simple step-by-step balloon column tutorial. 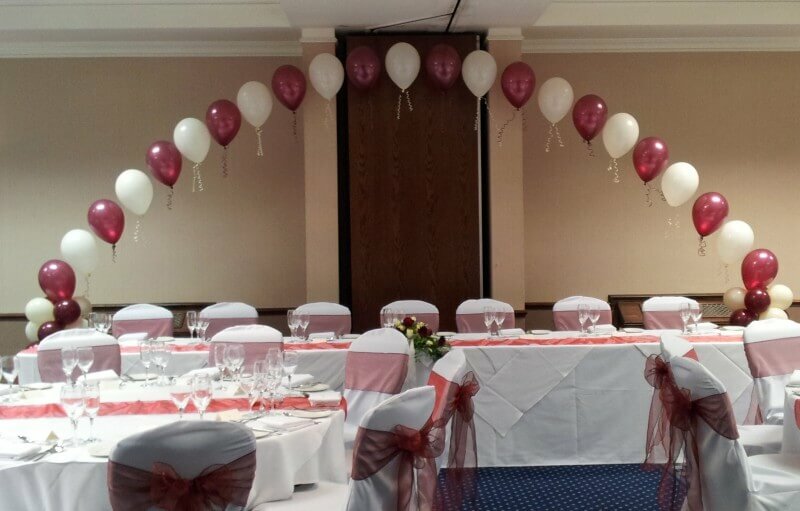 Ideal in combination with balloon arches, or as standalone eye catchers, balloon pillars are often placed at both sides of an entrance, table or stage. 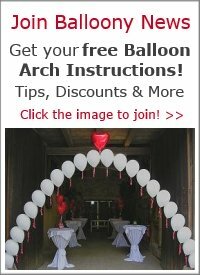 The technique behind making balloon columns can also be used for creating balloon sculptures, like a bride & groom or a snowman. The variations for balloon centerpiece decorations are endless. 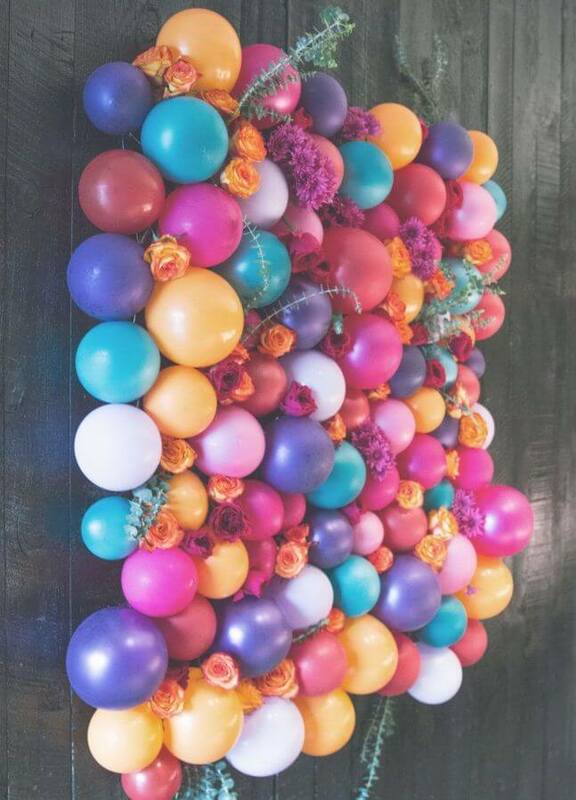 For example, you can vary the number of balloons (anything from 3 to 10 balloons is possible) and the way you arrange them (staggered or stacked). 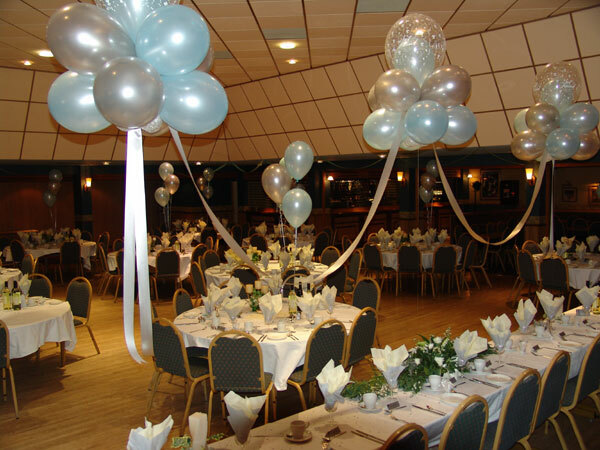 The image shows a simple, yet impressive example of a staggered design with just 3 balloons. Learn how to make this type of balloon bouquet here. 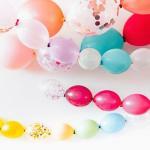 Combine plain balloons with printed ones, or latex with mylar balloons. Set romantic accents with tulle. Let your imagination guide you in creating beautiful matching bases for your balloon bouquets. In this example of a stacked or layered bouquet, we've used a potted plant as base. 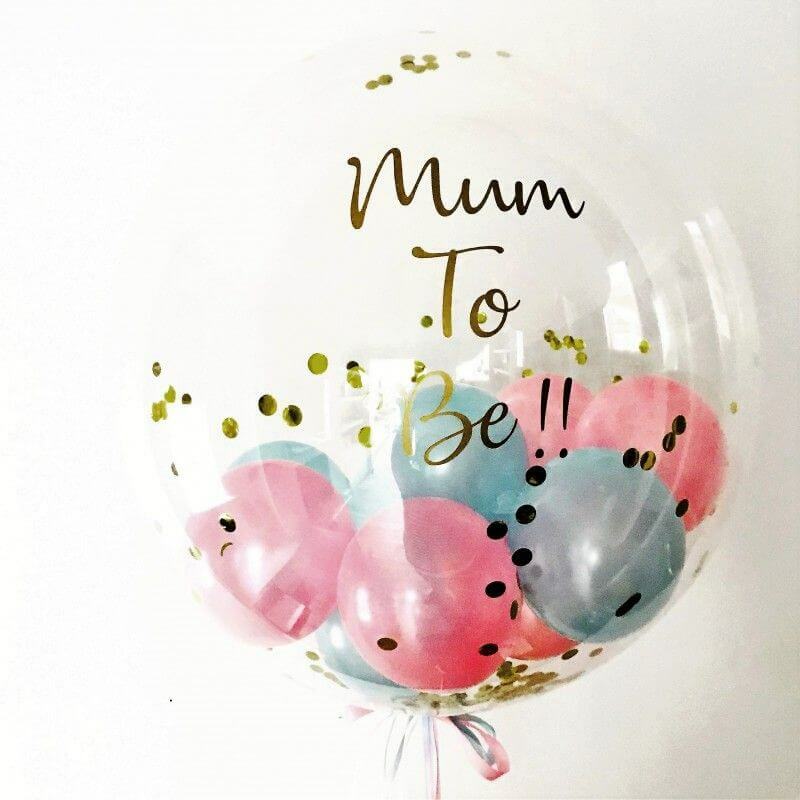 Perfect as balloon decorating ideas for Valentine's or Mother's Day! A fabulous way to surprise your spouse or friend with a gift voucher for a hot air balloon ride, or a spectacular decoration on its own. Hot air balloon models are such a fun balloon decorating idea and easy to make. 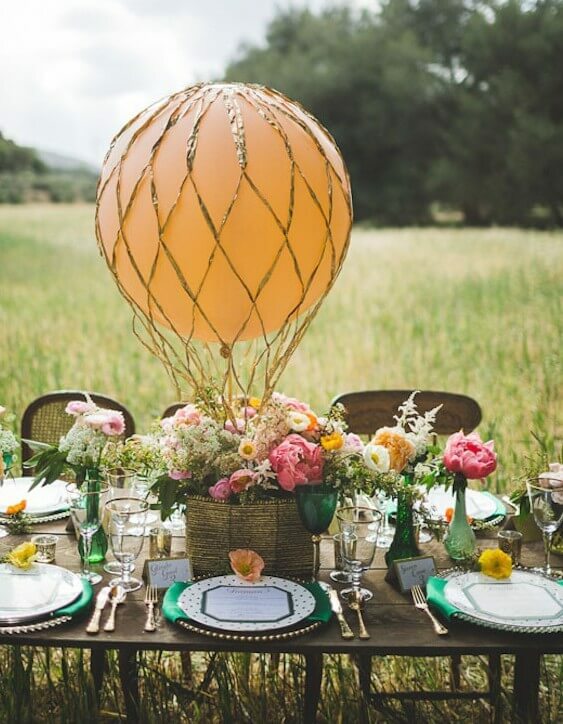 Organic balloon decor is a new and growing trend. I don't know about you, but I absolutely LOVE those designs. 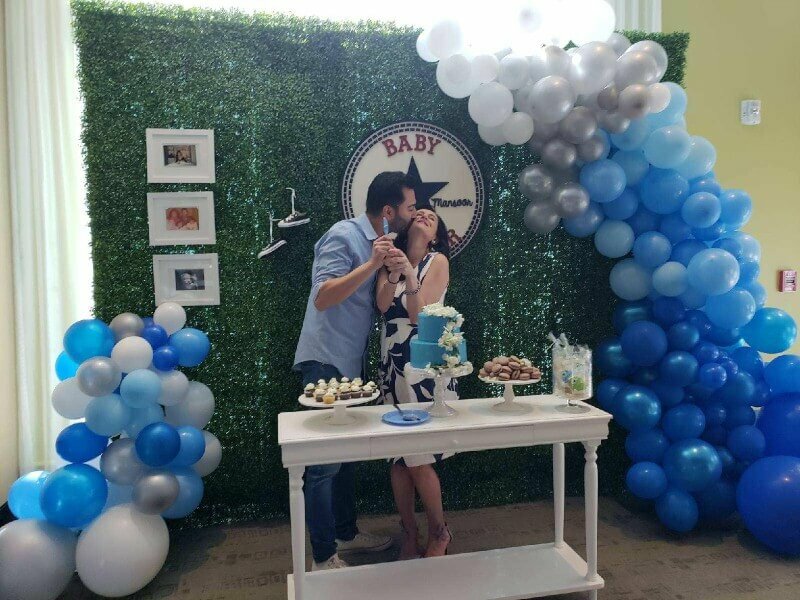 While in traditional balloon decorations it's all about blowing up the balloons to the exact same size, organic balloon decor gets its fanciful look from mixing balloons in many different sizes. The organic arch in the image above was created by one of our readers, following the instructions we provided. Another one among my all time favorite balloon decorating ideas. Giant 3 feet clear balloons with confetti and color matching tassels. 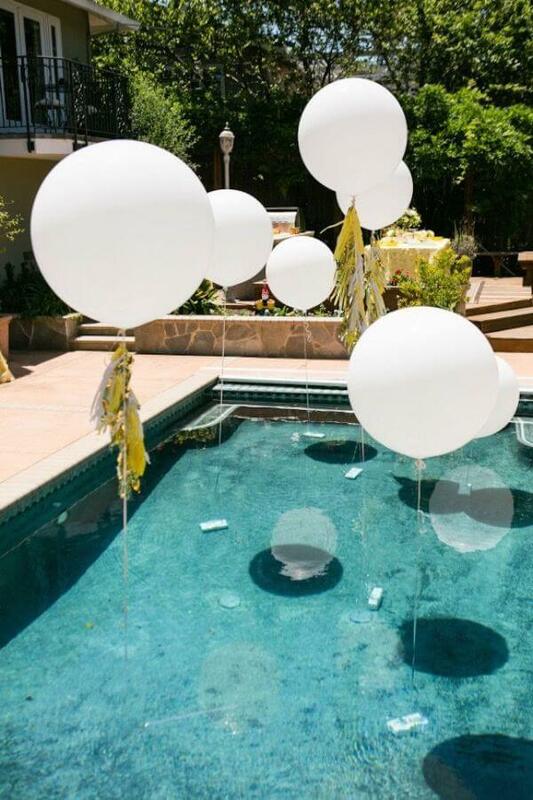 Just imagine having these floating above the tables at a wedding reception or graduation party. Heavenly! How to make confetti balloons yourself. I often get asked how to write on latex balloons. There are several types of markers you can use. 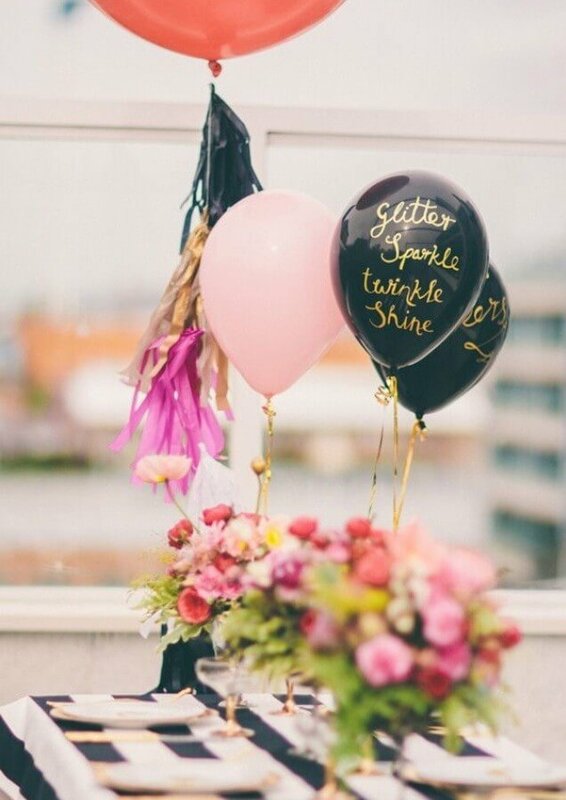 Gold letters on black balloons is for sure one of the most sparkling idea for customizing your latex balloons. Simply awesome. `Nough said. In case you wonder what weights to use so that the balloons float majestically around the pool, read my tips here. A lovely idea for any mom to be! Also works great as a personalized gift idea for birthdays, anniversaries, graduations or any occasion worth to celebrate. Creating these gumballs is easiest with a specialized balloon stuffing tool. 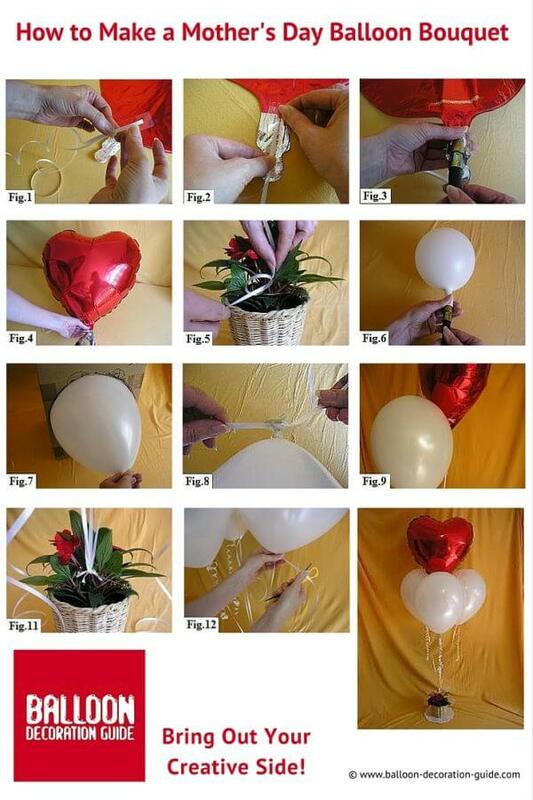 But you can also give it a try with our instructions how to manually insert smaller balloons into larger ones. Link-o-loon balloons have special "tails" at the opposite end of their necks. This makes it super easy to tie them together and create glorious floating arches, as seen in the picture. They also make for a cute entrance decoration. 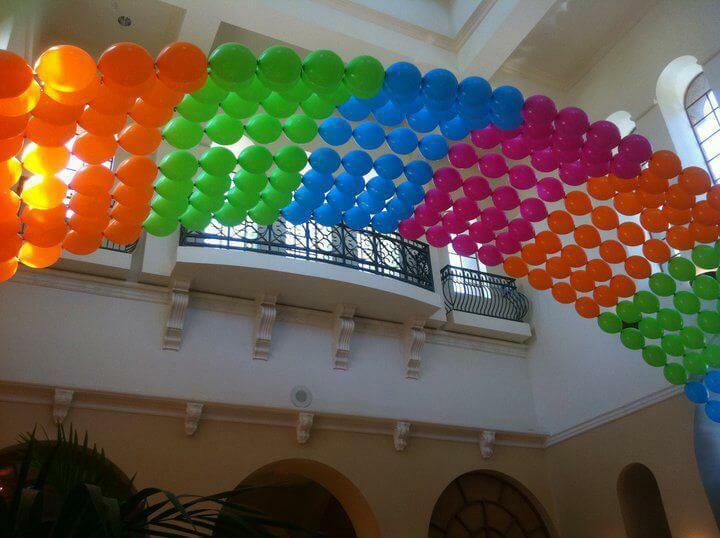 If you lean the arch against the wall, you can fill the balloons with air instead of helium. 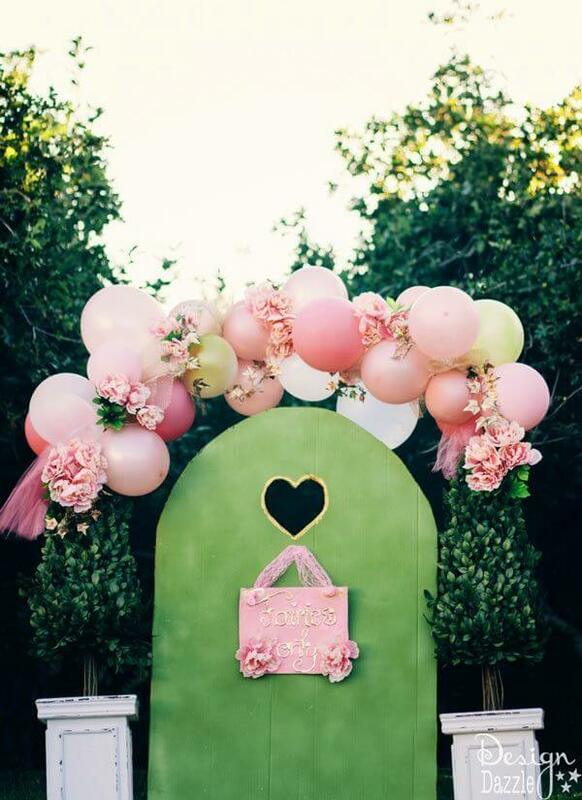 Here are some tips about making a link-o-loon arch. Special tip: If you do a search for "link-o-loon arch instructions" at eBay, you will find link-o-loons at good prices with instructions included in the set. These tulle balloons are a dream for any wedding cake table, baby shower or pastel themed summer party. 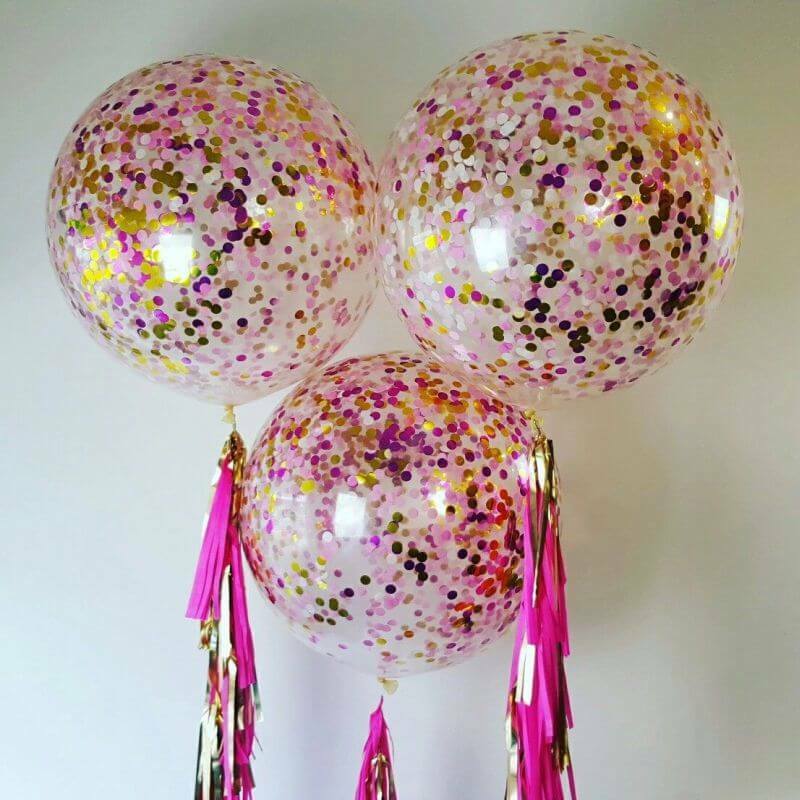 Very important: if you want them to float, choose large balloons (30 or 36 inches), good quality helium and very light weight tulle. 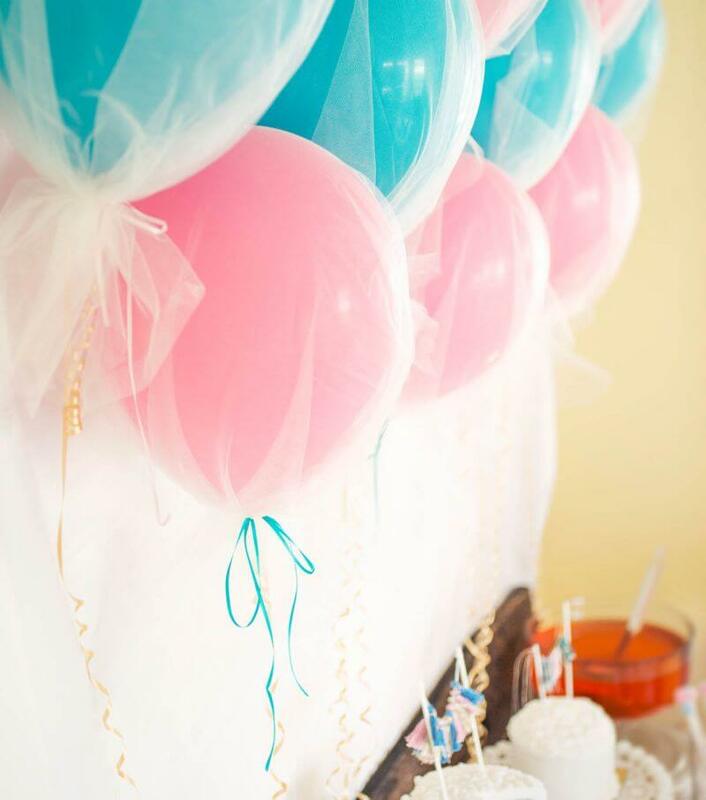 Smaller balloons often get weighed down by the tulle and won't float. The video below shows a nice step-by-step how to create large, floating tulle balloons. 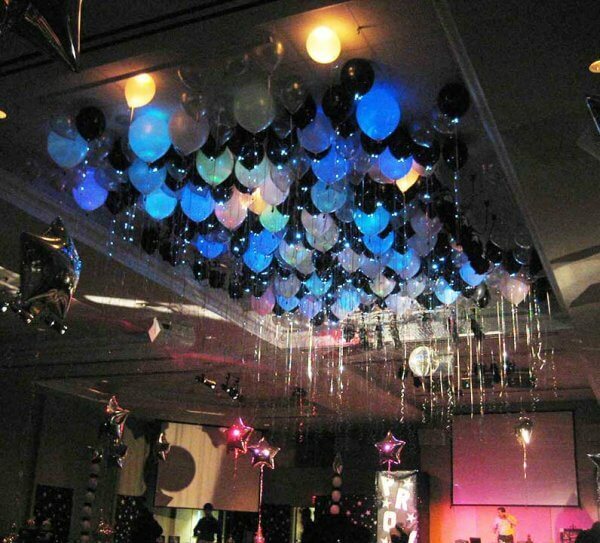 Another awesome and rather simple (but not cheap, you need lots of helium) balloon decorating idea: balloon ceilings. The tricky question is: how do you keep them from floating around the room? Read my advice here. Not only will you create a real eye-catcher with this balloon backdrop, but you'll also get a lovely scent from the interspersed flowers. I agree with Toni from Design Dazzle that this flower and balloon arch makes you feel like you are about to enter a fairy tale. 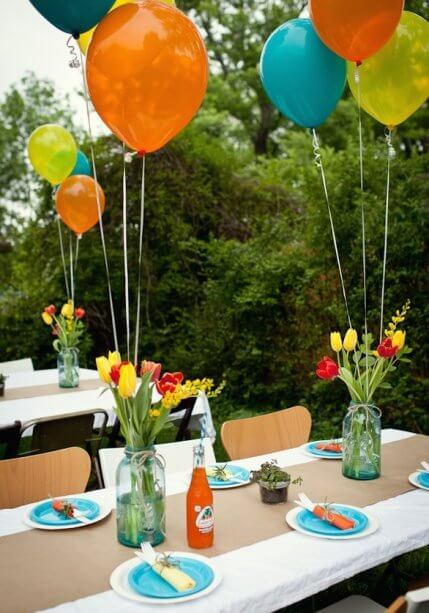 What a super design idea for a garden party! And think about the awesome pictures you can take with this kind of background. Cute idea for your little girl's or boy's birthday party. The kids will have fun helping you make those happy yellow bees, too. Anyone fancy some grapes, bananas or pineapples? 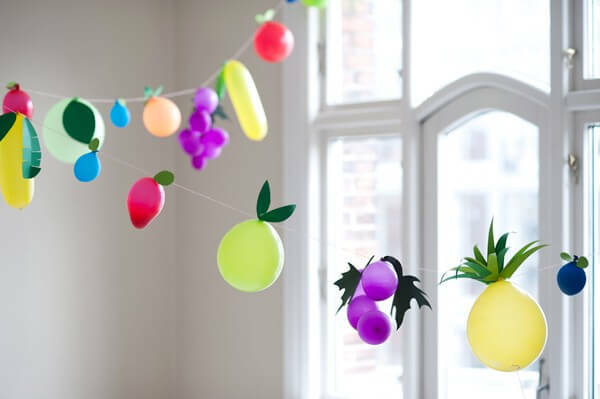 Who would've thought that you can even create a fruit garland with balloons. 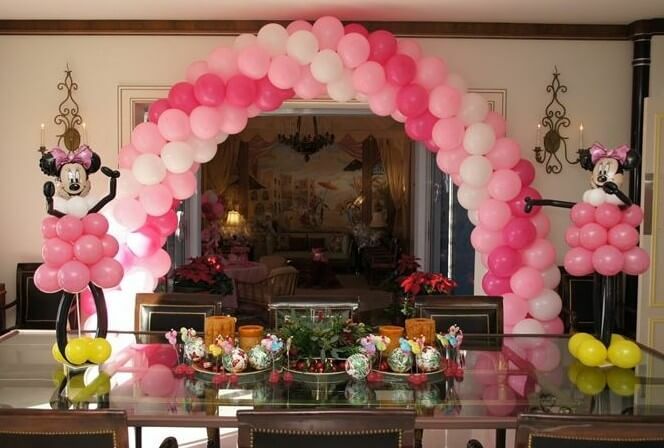 Isn't this balloon garland a fabulous eye-catcher for your Thanksgiving celebration? 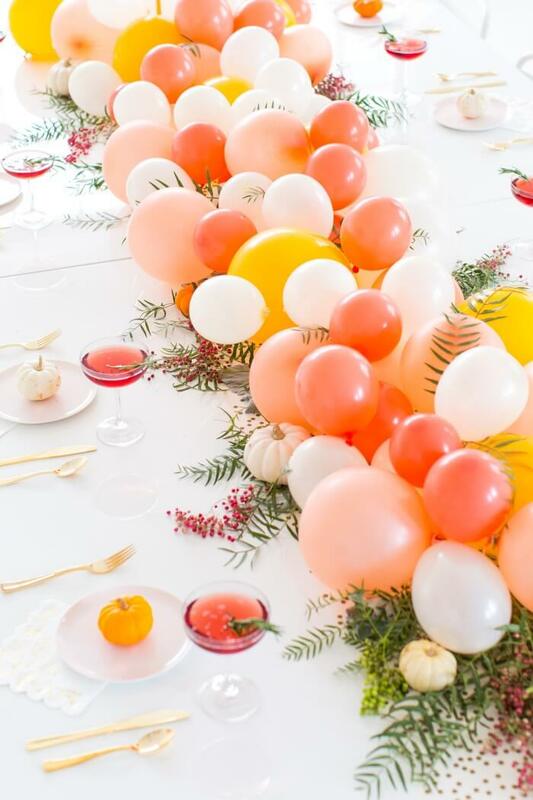 The mix of different sized balloons in orange, rose and pearl white colors makes for such a bright and happy atmosphere. The balloons are arranged and kept in place with a balloon decorating strip, which makes this garland much easier to do yourself than you may think. Be on cloud nine for a while with these heavenly floating balloon clusters. Ideal for weddings, anniversaries or corporate events. You can make balloon clouds yourself with our step-by-step tutorial. 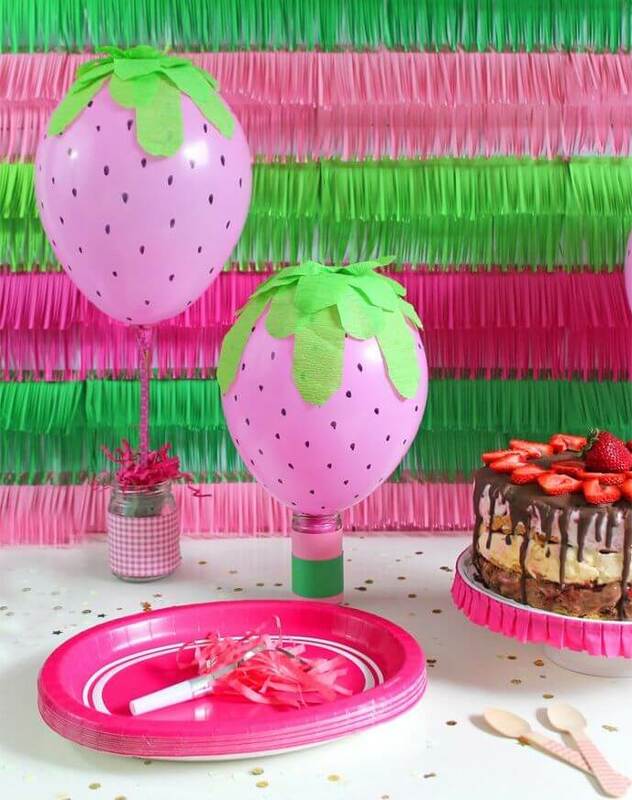 These strawberry balloons are super easy to make. All you need are pink 11 inch latex balloons, a black marker, green crepe paper, glue, paper straws and empty jars as base. Or you could hang them from the ceiling with fishing line. 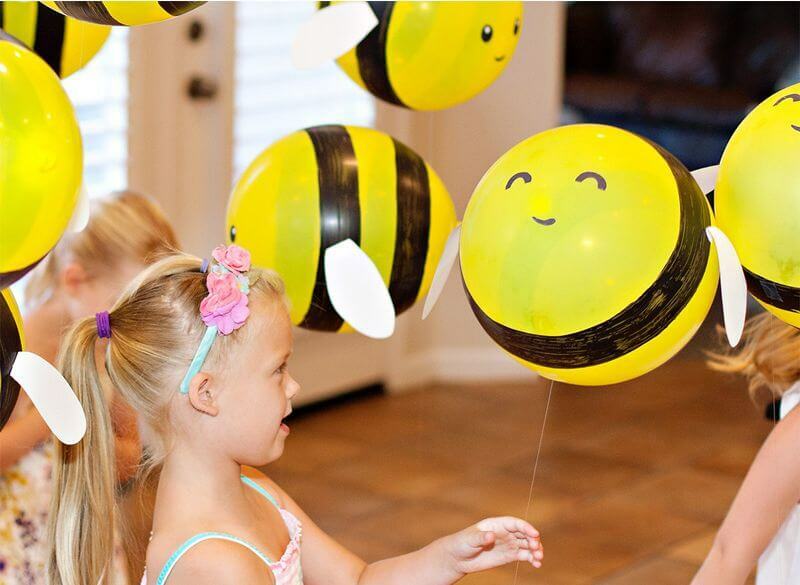 I hope you enjoyed these balloon-o-tastic balloon decorating ideas from around the Web. If you did, please pin and share. Which other fabulous balloon decorations have you found or - even better - tried yourself? Let me know in a comment below. 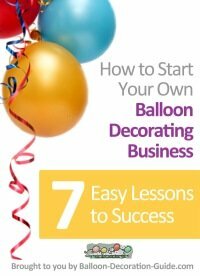 Interested in Starting Your Own Balloon Decorating Business? Looking for Wedding Decorating Ideas?